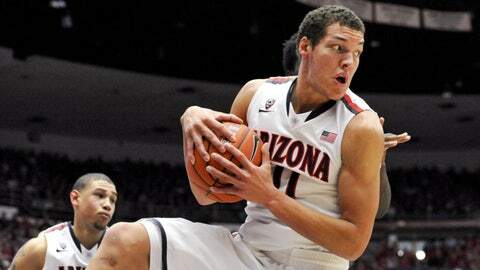 Arizona forward Aaron Gordon gets the rebound during the first half Thursday against Colorado at McKale Center. TUCSON, Ariz. — The McKale Center crowd buzzed in the minutes before the opening tip, more like a postseason game than another conference game. With support like that, it’s not hard for top-ranked Arizona to get off to a fast start. Charged by the mojo created inside one of college basketball’s best home-court advantages, the Wildcats raced out to a big lead and held on down the stretch to remain unbeaten with a 69-57 win over Colorado on Thursday night. "This is why we love McKale; we feel like it’s like this all the time," said Arizona forward Brandon Ashley, who had 15 points. Arizona (19-0, 6-0 Pac-12) had a week off after blowing out rival Arizona State and was still in a groove early, building a 14-point lead in the opening six minutes. The big lead allowed the Wildcats some leeway in the second half when things didn’t go quite as well. Arizona struggled from the perimeter, making 3 of 15 from 3-point range, had a rare night when it didn’t outrebound the opposition (32-32) and missed three free throws in the closing 72 seconds to keep the game from becoming a rout. The Wildcats pulled it out thanks to the big start and 44 points in the paint, allowing them to tie — with the 1992-93 and 1997-98 teams — for the longest winning streak in school history. Nick Johnson led Arizona with 18 points and Aaron Gordon added 12. "Our second half maybe wasn’t as good as our first, but there are always good lessons to be learned from that and still leave with the win," Arizona coach Sean Miller said. A year after nearly pulling off an upset in the desert, Colorado (15-5, 4-3) had no chance for late-game heroics in its third game without leading scorer Spencer Dinwiddie. The Buffaloes struggled to slow Arizona’s bevy of scorers and couldn’t shoot their way out of the big early hole, falling to 0-16 all-time against No. 1 teams. Xavier Johnson led Colorado with 21 points and Josh Scott added 15 with 11 rebounds. "We dug ourselves a hole," Colorado coach Tad Boyle said. "We had trouble scoring the ball and they made shots. We didn’t have an offensive rhythm all night. The Buffaloes split their first two games without Dinwiddie, losing to UCLA and beating Southern California after the junior sustained a season-ending left knee injury against Washington on Jan. 12. Arizona was a much stiffer challenge without Dinwiddie, Colorado’s scoring and assists leader. The nation’s top-ranked team for seven straight weeks, Arizona entered the game fifth in scoring defense (56.7 points) and shooting percentage against (37 percent) and was 22nd at defending 3-pointers (29 percent). Colorado needed someone to step up and no one was able to do it early against Arizona’s relentless pressure. Barely able to get passes off much less good shots, the Buffaloes missed their first five shots and had four turnovers in the opening six minutes. Arizona also missed its first five shots, but started dropping them in from all over, building a quick 18-4 lead. The Buffaloes settled down for a little bit, cutting the lead to six with a 10-2 run. We were playing the No. 1 team in the nation, but they weren’t that good. We didn’t come in here with the (right) mindset and it’s hard coming into this atmosphere. All that seemed to do was make the Wildcats play harder. Ratcheting the defensive pressure back up, Arizona hounded the Buffaloes into more missed shots and turnovers, leading to breakouts and 3-pointers at the other end. Starting with a 12-2 run, the Wildcats built the halftime lead to 39-24, holding Colorado to 8-of-27 shooting while forcing nine turnovers. Johnson had 12 at the half and Ashley nine. "We do what we’ve been doing, just focusing on the process of Arizona basketball and that’s just a little glimpse of what we can do," Gordon said. Colorado had a little more success shooting to start the second half, hitting three of its first four shots. Problem was, the Buffaloes couldn’t stop the Wildcats. Arizona hit its first six shots, including one by Ashley that bounced off Scott and into the basket and a reverse dunk off a spin move by Gordon that put the Wildcats up 51-31. The Wildcats made 12 of 22 shots in the second half to prevent Colorado from cutting the lead under double digits. "We were playing the No. 1 team in the nation, but they weren’t that good," Xavier Johnson said. "We didn’t come in here with the (right) mindset and it’s hard coming into this atmosphere."